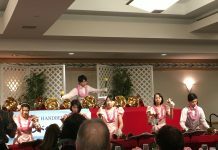 The East Hawaii Hiroshima Kenjin Kai held its 49th annual meeting and shinnenkai on Feb. 28 at the Honpa Hongwanji Hilo Betsuin’s Sangha Hall. 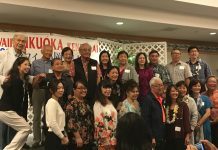 Highlighting the event were the introduction of the 2016 Beiju honorees — those who were born in 1928 and have already turned, or will turn, 88 years old this year — and the announcement of two scholarships being offered by the Kenjin Kai. Thirteen members were presented certificates from the East Hawaii Hiroshima Kenjin Kai and a commemorative citation from Hiroshima Gov. Hidehiko Yuzaki. Recognized were: Fumiko Hakoda, Emiko Hamakawa, Susan Hashimoto, Kiyoko Imada, Larry Isemoto, Sue Johnson, Kazue Kaide, Yoshiko Kaisen, Taeko Kunimitsu, Wallis Nagareda, Yoshimi Nakayama, Norma Samson and Clara Yanabu. 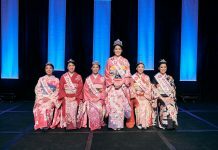 The East Hawaii Hiroshima Kenjin Kai is offering $1,000 scholarships to two graduating high school seniors who plan to continue their post high school education this fall. Applicants must be a senior at any East Hawaii public or private high school and must enroll full-time (12 or more credits) at an accredited college or university for the 2016-2017 academic year. The scholarship is available to the children or grandchildren of East Hawaii Hiroshima Kenjin Kai members only.